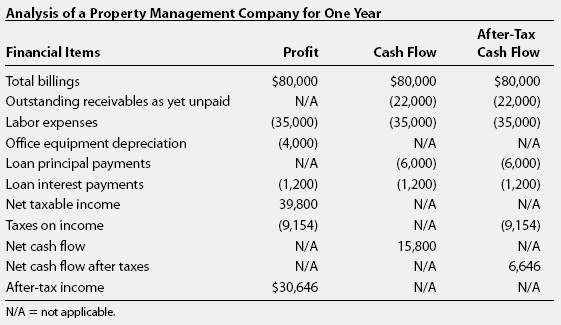 A financial analysis of an income-producing property to determine cash benefits to the owner after paying all expenses,mortgage payments,and taxes,and after deducting amounts that must be taken into income for tax purposes,but which have not yet been collected. If the tax savings from depreciation or other tax shelters will result in tax losses, thus reducing taxes that must be paid on other income,then those savings are added back in,just as if they were additional income. The intent is to discover the amount of money that can be deposited in the bank at the end of each year. Buyers justify purchase price by the after-tax cash flow they expect to earn. 75 per diluted share and for after-tax cash flow of USD669-USD696m. With several federal tax court decisions, we now have a valuable tool for increasing the after-tax cash flow of almost any commercial property. child support payment scenarios simultaneously and is presented with estimates of the after-tax cash flow for both parties. With the new opportunities we've announced in our two largest core areas (Spraberry and Raton), our active onshore drilling program and plans to expand drilling in 2009, we are highly confident that the Company will continue to deliver consistent growth and achieve our recently increased target for 14+% compound average annual growth (CAGR) in production per share and 20+% CAGR in after-tax cash flow through 2011. Free cash flow, which is after-tax cash flow minus capital expenditures, was $559,000, up from a a deficit of $6. Deal structure is important in any effort to maximize after-tax cash flow on behalf of a seller. 29) The stipulation of domestic source income is important because for a firm in an exemption country expected cash flows with foreign source could represent an after-tax cash flow (e.
The sale price has been agreed as USD83m, which is expected to generate after-tax cash flow of approximately USD90m. If you think that's good news, consider this: the increase in annual after-tax cash flow through accelerated depreciation can be retroactively applied all the way back to 1987. Estate value includes the 4% after-tax cash flow from retained investments, which was made possible due to the presence of the LTC insurance. LTC insurance executive benefits: more than meets the eye? The interest tax shields on both cash and non-cash debt are added because both types of interest tax shields reduce taxes and, thereby, increase after-tax cash flow.